Dozens of passengers have been injured on August 13, 2014, Wednesday around 4 p.m. as a defective Metro Rail Transit train crashed into a barrier at the Taft Station. A post by the management on twitter said that despite the incident causing MRT to stop the operations for the rest of the line, both southbound and northbound trips already resumed at 5 p.m. 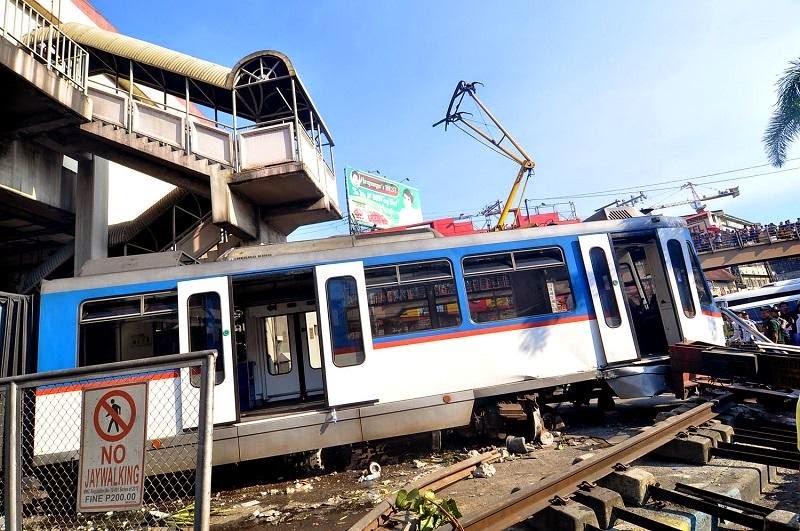 According to Senior Superintendent Florencio Teodosio Ortilla, the Pasay City police chief, MRT operations would not be stopped by the accident, however, since they were using a “single track” in reversing, passengers should expect delays. At least 38 passengers were injured because of the impact and were rushed to San Juan de Dios and Pasay City General Hospitals, according to Ortillia. “Three were seriously injured. A man suffered fracture on his foot while the others suffered lacerations,” Dr. Noel Lo of the Pasay City General Hospital said. Meanwhile, the Land Transportation Franchising and Regulatory Board (LTFRB) took action to assist commuters in the aftermath of the accident. LFTRB Chair Winston Ginez said that he will ask the city bus operators to ferry stranded MRT passengers. “The MRT regrets the unfortunate incident, the management will extend all necessary assistance to those injured and inconvenienced,” MRT management tweeted regarding the passengers in the said train. Hernando Cabrera, the spokesperson of the MRT said that the train came to a halt at the Magallanes Station due to technical problems in an interview over dzBB. The automatic brake kicked in, a built-in safety feature to prevent runaway trains. However, the automatic brake was deactivated so a functioning train can push it to the last station. Passengers were also trapped in the broken train because there was no safe exit for them by that moment. Cabrera further narrated, “Ang naging problema po natin, nakalas po iyong coupling na nagkakabit dun sa mga tren”. (The problem was, the coupling that connects the trains together broke.) It was then that the uncontrolled train continued to move causing the first train to ram into the metal stopper, which gave way until it hit an electric post outside the Taft Station on which Robert Granado of Pasay police perceived that it would have been a bigger accident if it were not for the post. One of the passengers named Regina Santos also gave her side of the story. “Sabi naming bababa na lang kami pero hindi kami pinababa. Nagstampede na sa loob,” she said. (We told them that we would get off but they did not allow us. It caused stampede inside.) Passengers panicked and hurriedly pushed through to the first coach, which is reserved for the elderly and pregnant women. She also said that they thought they heard a loud explosion after the south-bound train left Magallanes Station. With these, MRT management still continues to investigate the accident to determine whether it was caused by human or technical error. They also checked if the coupler was actually engaged properly before the trains ran or it uncoupled while the two trains were running. The driver of the train was also brought to the MRT center for investigation, according to Calixto. Also, it should be noted that the station from Magallanes to Taft Avenue is a downward ride.